I attended the Planning Institute of Australia conference held in Perth 9th-11th of May 2018. In my role as Policy Adviser to NZ Planning Institute I've also been to the previous conferences held in Sydney (2017) and Brisbane (2016). Increasingly, the topic of housing affordability and rapid urbanisation has moved to the top of the conference programme. The focus of this posting is a field trip I did. It looked at the rapid urban growth occurring north of Perth, in and around an area called Alkimos. Alkimos is a coastal suburb of Perth, Western Australia, located 42 kilometres north-northwest of Perth's central business district. It is part of the City of Wanneroo local government area. We spent most of our time on the field trip learning about the Shorehaven part of Alkimos, (See: shorehaven.com.au), and learning from one of the developers (See: peet.com.au). It's difficult to summarise it all for a posting, but the picture that emerges is that State/Federal Government agencies work to consolidate land packages, and then seek a partnership with a developer which must indicate how it will deliver on various development objectives (amount of public open space, providing for amenity such as retail and commercial development and employment opportunities, sale price of home + land packages). All planning for access to central rail (fast electric) and to state freeway is in place, and much of that transport infrastructure is either built or underway, largely under control of Federal Government. here, you'll experience true waterfront access like no other. Homesites in the Bluewater Release are located less than 1km from the stunning Shorehaven beach and 4 hectare Waterfront Park, which offers direct access to 1.7km of swimming beach and a beach cafe. Adding to the cosmopolitan feel, the future Coastal Village Centre will soon be taking shape, boasting shopping and dining options. Major shops, schools, entertainment and dining options can all be found close by within the expanding City of Joondalup, just a 20 minute drive away. Perth CBD is within easy reach, thanks to the nearby Butler Train Station. The new Mitchell Freeway extension has also put Perth only a 37 minute drive away. Plus, with a a range of contemporary house and land options available, tailormade for this unique coastal community, it's time to make your coastal dream a reality today at Shorehaven Coast. This is a 3 bed, 2 bathroom home, with a double carport at the rear. 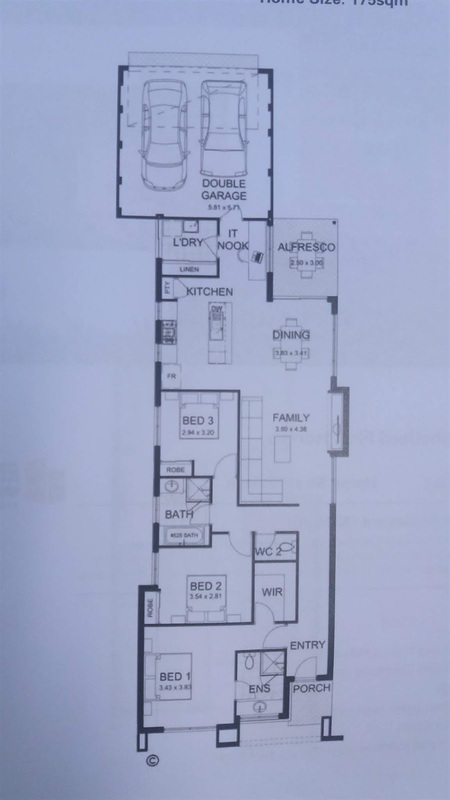 Home size is 131 sq metres, land area is 210 sq metres. Stainless steel appliances, lockable Jason windows, 25 year structural guarantee, spacious master suite with walk in robe - as the blurb goes. Looking at the blurb for the whole development, land price would make up about half the whole price. Also a 3 bedroom home. 2 bathrooms. Double garage at rear. Midland brick double clay brick construction. Bluescope Colorbond steel roof. Alfresco all-weather area under main roof. Gourmet galley style kitchen. Premium European styled stainless steel cooking appliances. 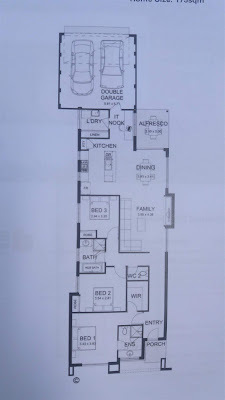 The floor-plan is shown to the left. A 4 bedroom home. 2 bathrooms. Double garage at front. 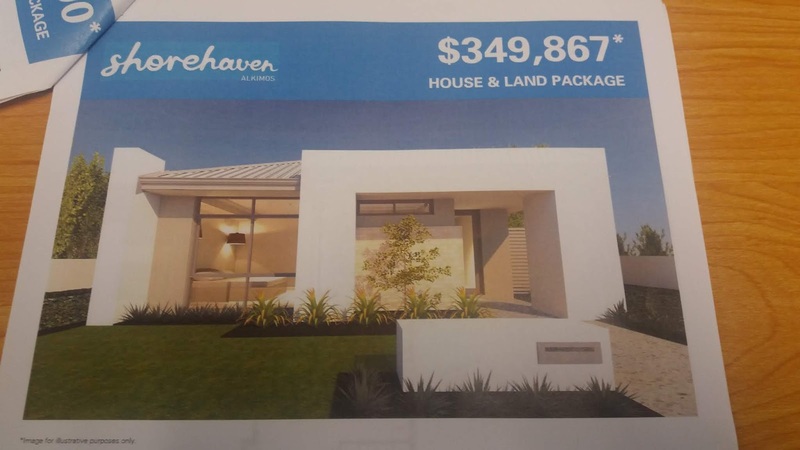 202 sq metres of house on 375 sq metres of land. Incorporates a "secluded" home cinema etc. 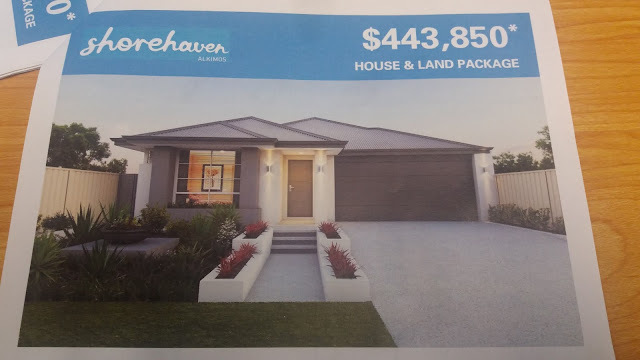 You have to admit, these prices, and the amenity that comes with each home, makes what we do here in Auckland look pretty poor - and expensive - by comparison. 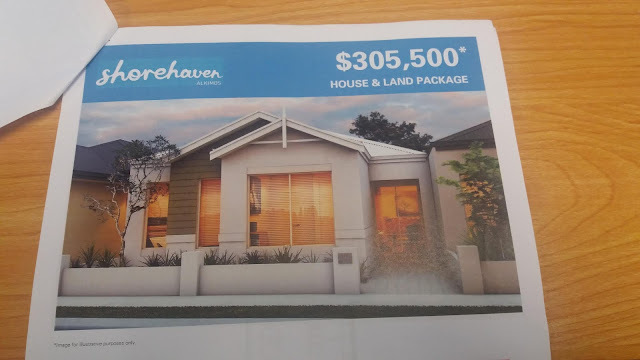 When I asked the developers how they offered homes like these, at these prices, they didn't really have an answer. They didn't have a clue why new homes should be so pricey in Auckland, New Zealand. One thing was clear though - the central government involvement in land amalgamation, and the subsequent beauty contest with developers for the right to develop and market the homes and the rest of the development, gave government a lot of power when deciding which developer(s) would be partnered with for the development. The story doesn't end there however, because while we on site we were also shown through two apartments. These were for sale between $300,000 and $400,000. You can see from the videos I shot their proximity to, and views of, the beach. Each apartment was two bedroom, two bathroom. One was two storey - one was single level. New Orleans: French or Spanish?